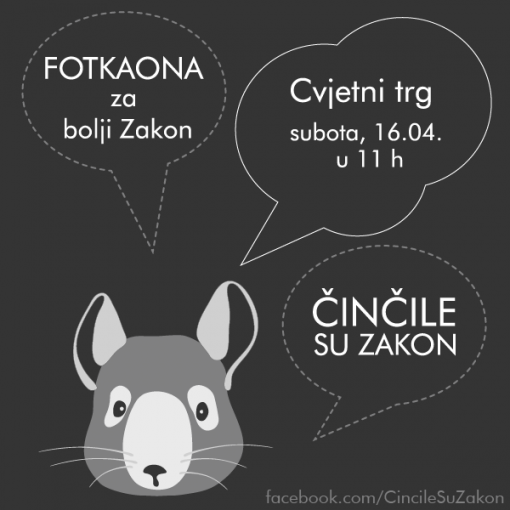 AFC - 04/16/16 Strike a Pose and Say, "Chinchillas Rule"
Animal Friends invite you to a photo op on Zagreb's Cvjetni trg on Saturday, April 16, from 11 a.m. Freeze the moment with celebrities and our mascot Chinchi in the Photo Booth. Having seen the light of day on billboards across Croatia and video messages of the ambassadors Goran Visnjic, Vanna, Ivica Kostelic, Luka Nizetic, and Iva Sulentic, the "Chinchillas rule" campaign will again come alive at Zagreb's Cvjetni trg, at the intersection with Warsaw Street on Saturday, April 16, 2016, from 11 a.m.-1 p.m.
Media representatives and citizens will be greeted by the campaign ambassadors Luka Nizetic and Vanna at 11 a.m., as well as Bojan Jambrosic, Dalibor Petko, Dino Jelusic, Drago Plecko, Durdica Vorkapic, Ibrica Jusic, Igor Mesin, Lea Dekleva, Nada Rocco, Nenad Borgudan (Detour), Robert Boskovic, and other celebrities. This will be an opportunity for everyone interested in actively supporting the campaign to pose with celebrities and props in the Photo Booth and spread the campaign message, "Chinchillas rule". "A picture is worth a thousand words and that's why we invite everyone to show their positive attitude toward banning fur farming to their virtual and other friends. All who agree with Goran, Vanna, Ivica, Luka, and Iva and want to help chinchillas, dogs, and other animals can with ease ask their friends, acquaintances, and family to speak out for a better Animal Protection Act," says Luka Oman, Animal Friends' president. Photos can be instantly uploaded to Facebook, Twitter and email directly from the Photo Booth. Participants will also receive a printed photo as a memento of their support for the campaign. Croatia adopted the ban on fur farming in 2007, supported by more than 73% of citizens. This important decision was adopted by countries such as the United Kingdom, Austria, Slovenia, Macedonia, Serbia, and Bosnia and Herzegovina, while many others are moving in the same direction. Instead of backtracking, this amendment to the Act could be used to improve the legislation, such as banning the killing of dogs in shelters. You can join the "Chinchillas Rule" campaign by signing the petition and changing your profile picture on Facebook using the Twibbon app: http://goo.gl/DVeuzw, which has been used by hundreds of people to show their support. The "Chinchillas Rule" video can be found on the Animal Friends YouTube channel: www.youtube.com/afcroatia. The "Chinchillas Rule" campaign has been launched in cooperation between Animal Friends and Drimia PR Agency. The campaign has been supported by many volunteers and participants. Sponsorship and media sponsorship is provided by EPH, Europlakat, Zagreb Plakat, Vector Group, and Arto.